After a long wait of 2012 Summer Olympics by the sports enthusiasts around the world, the games were inaugurated with a great applause and a grand opening ceremony at 9 pm on 27th July 2012. The ceremony truly titled “Isles of Wonder” opened doors for many happenings enclosed in the exciting battle for medals. Olympic Park in east England, the venue for the games hosted range of exciting events and attractions during the games. Some of the best athletes from around two hundred four nations were welcomed at Olympics 2012. The beautiful mascots for these games the one-eyed characters 'Wenlock' and 'Mandeville' were created from the last two drops of steel used for the London Olympics 2012. The big list of sports included twenty six different types of sports. This was the third time London was hosting the Olympic Games. Fifty three African, forty four Asian, forty nine European, seventeen Oceania and forty one American countries participated in the games. The parade of nations at the opening ceremony was accompanied by athletes and officials of 204 nations, led by Greece team. It was followed by other countries and finally the hosts Great Briton. The Olympic flag was carried by eight people chosen as symbols of the Olympic values. This time Indian Olympic Association had sent total eighty three athletes for competing in thirteen different sports. This was the largest team India had ever sent to the Olympic Games. Sushil kumar was holding the Indian flag during opening ceremony. After the glorious opening ceremony, every day increased the curiosity of the spectators. China started with a brilliant start bagging maximum medals in the initial stage. India stood with the best ever performance regarding number of medals won at Olympic Games and finished with total six medals two silver and four bronze. The success story of Indian medals started with the first bronze medal won by ace Indian shooter Gagan Narang in the ten meter air rifle event. Vijay kumar brought the second medal which was the first silver medal for the country in men’s 25 m rapid fire pistol event. 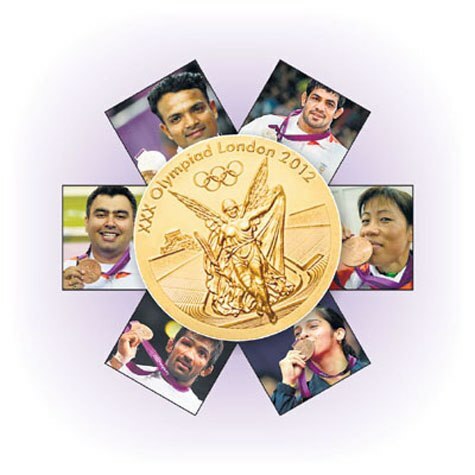 Indians throughout the world rejoiced with joy and cheers for this first silver medal received at London. Keeping the score board of medals moving, Saina Nehwal won a bronze medal in women’s singles for Badminton. The fourth medal was brought by Mary Kom by winning a Bronze in the women’s flyweight boxing event. She is the first Indian women to win a medal in boxing at the Olympics. Yogeshwar Dutt won a bronze in the 60 kg freestyle wrestling event. The second silver medal was snatched by Sushil Kumar in 66 kg freestyle wrestling. He became the first Indian to win an individual medal in consecutive Olympics. This comparatively good performance of the athletes has raised India’s hopes and they are expecting still more number of medals at the next Brazil Olympics in 2016. The games were concluded with United States achieving total 104 medals and standing on the top of the medal list. Like the opening ceremony the closing ceremony of the Olympics 2012 on 12th August 2012 was also amazing. Mary Kom was the Indian flag bearer at the closing ceremony. At the end of the ceremony, the Olympic Games were handed over to Rio de Janeiro for the 2016 Olympics. The Olympic flame was extinguished, signaling the official end of the London 2012 Olympic Games. We at Magic Holidays crave for India’s best performance in the next Olympics at Brazil.